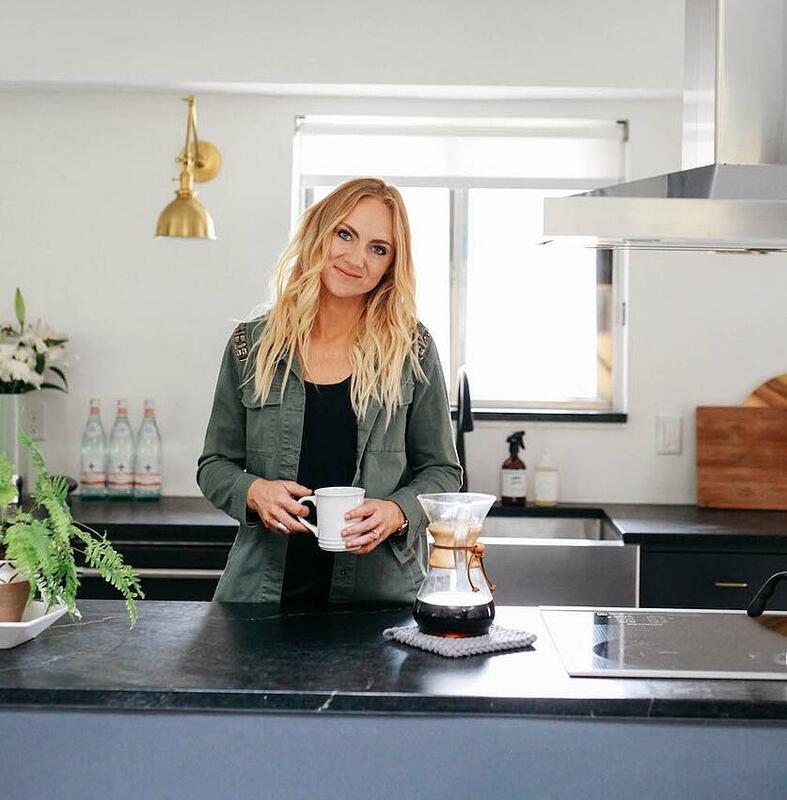 Interior stylist and blogger Kirsten Grove, recently set out on a total renovation of a mid-century Idaho home that was stuck in the 90s. (Think crystal chandeliers and brown countertops.) She and her husband do most of the work themselves adding character, ingenuity and style to every room with simple materials and a monochromatic pallette. Grove is also the author of Simply Styling, a practical guide to creating a stylish and lived-in home. 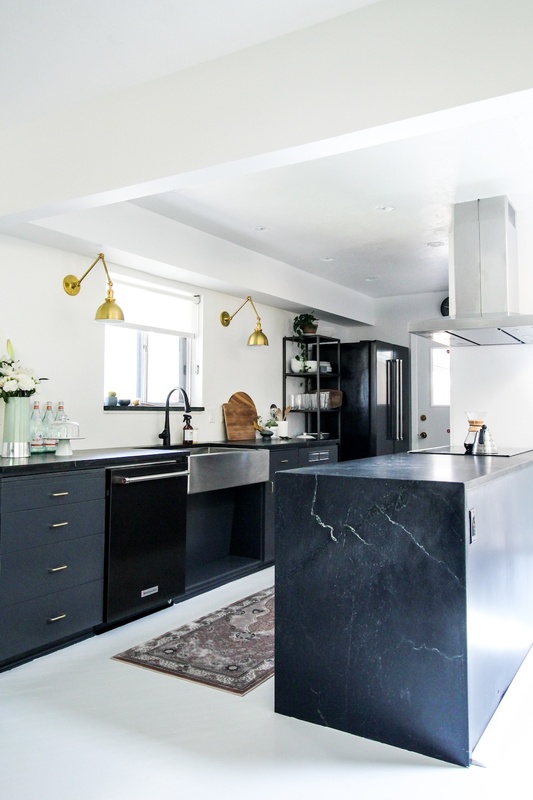 We caught up with Grove recently in between book tour prep to chat about her new matte black kitchen featuring Polycor's Alberene Soapstone. Out of all the materials you could have chosen (including the concrete you had in a previous home), why were soapstone countertops appealing? The colors and textures are just so intriguing to me! You just don't see the beauty of soapstone on a normal basis. I wanted people to walk in my kitchen and immediately be drawn to the textures. Other materials can be beautiful, but can also feel normal and dull. Soapstone is in a league of it's own. Did the black color of the waxed soapstone drive the design, or the other way around? I love Dean & DeLuca and I’ve always wanted to create a kitchen that had that same feel to it. They have always incorporated a lot of wood elements, blacks, grey and whites in their locations. The design allows the food to pop and the space to feel clean. 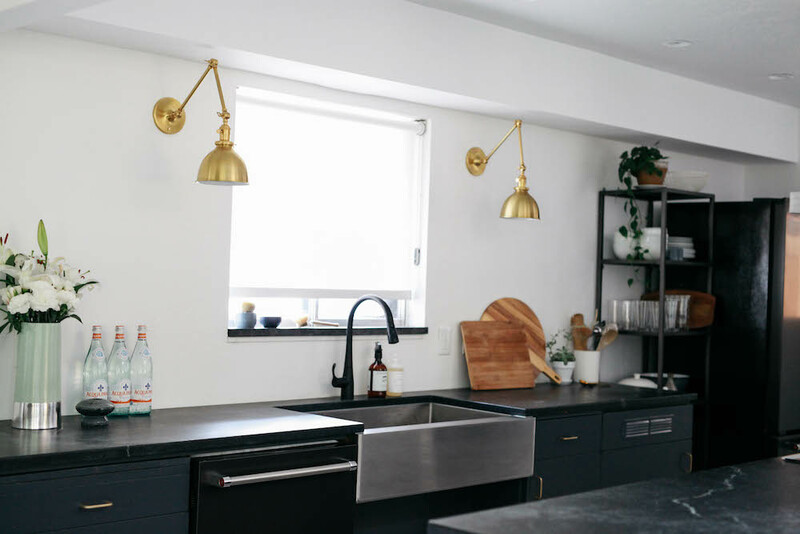 With the help of soapstone counters, black stainless appliances and white walls with no uppers, I think we have achieved a minimalist kitchen that I am now able to style with items that make a kitchen feel like a statement room. How do you feel about materials that patina and wear over time? I'm thinking soapstone of course, but also wood, metal, really good jeans. It gives the materials character and personality when you see them wear over time. Because I love a space to feel lived in as apposed to a stuffy showroom, this look is exactly what I wanted. More here on how soapstone ages. 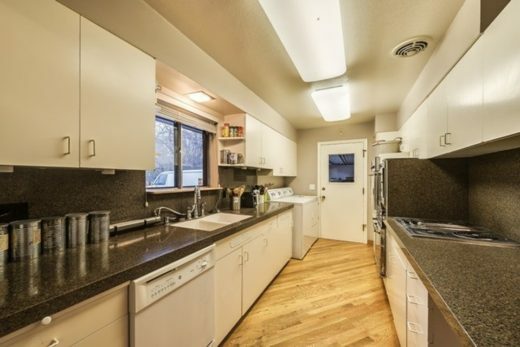 For a galley kitchen your kitchen is highly integrated into the living space. Tell me about your decision to waterfall the stone and how it relates to the dining and living spaces. A waterfall creates the look of an expensive piece of furniture. 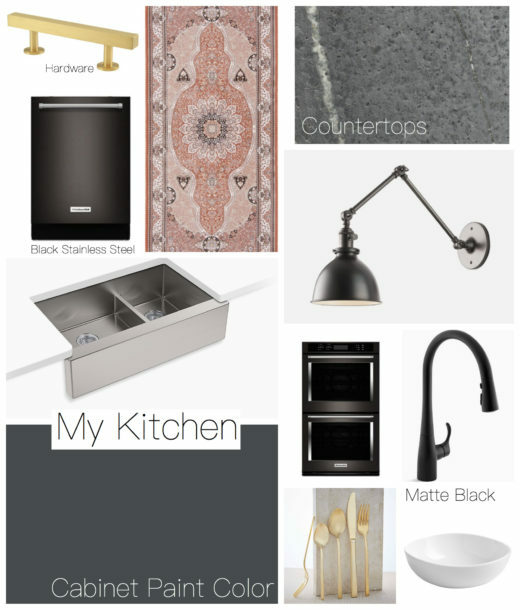 Because my kitchen is opened up to both living rooms and dining room, I wanted to create a show stopping kitchen. The waterfall creates that gorgeous look! 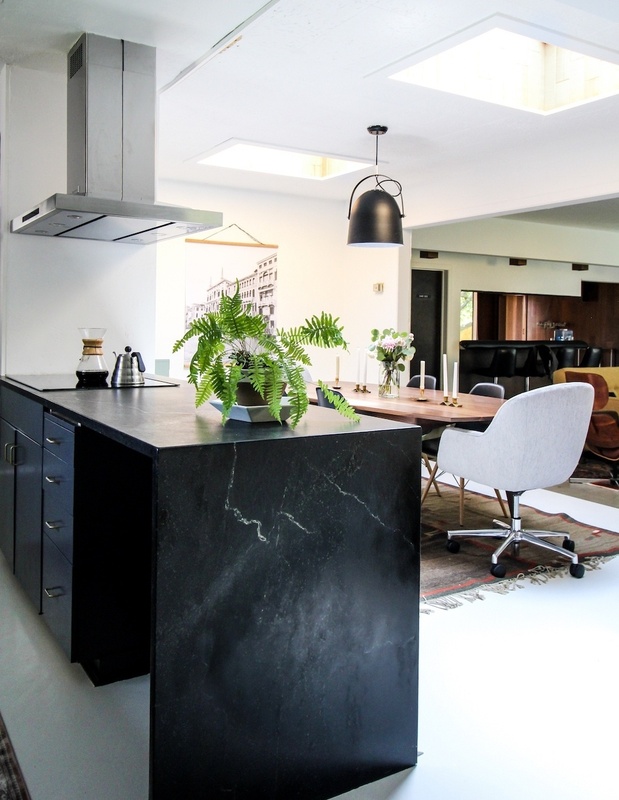 See more waxed soapstone kitchens here. Thanks to the artistic craftsmanship of fabricator Jack Savoie of Counter Culture, Kirsten was able to realize her design inspirations, especially with the mitered waterfall ends (look how seamless that joint is). "They did an absolutley amazing job installing our soapstone counters," Kirsten said. Your reno is a dramatic transformation. 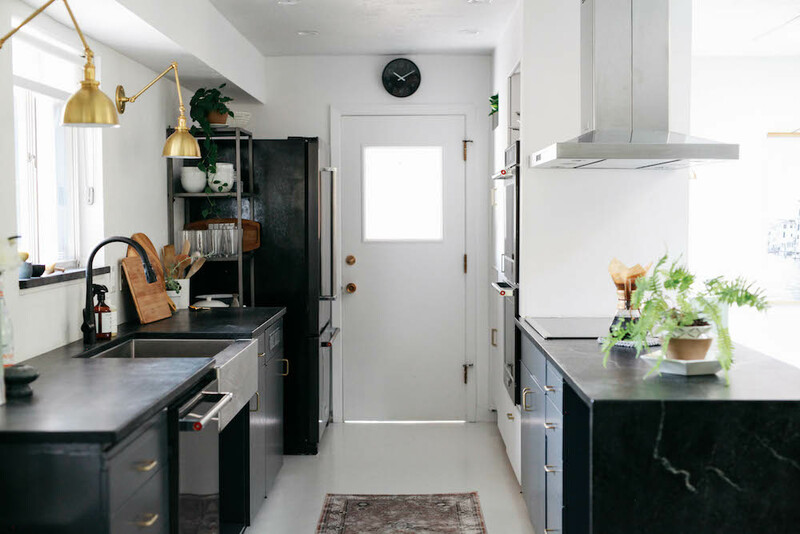 Describe how you felt when you swapped out those brown speckly granite for black kitchen countertops. When these counters were being installed, I was passing out. And that waterfall?!?! OMG. The beauty of these slabs are unbelievable. The crazy thing is that they start out a cement grey and the more you wax them (or you can use mineral oil) the darker they become. You can learn more about how to darken your soapstone in Polycor's care guide below. Download it for tips on waxing, cleaning and more. Photos by Karen E Photography and Kirsten Grove.